Chitranna – White, Yellow and Brown!!! Rice, Chawal, Arissi, Bhiyam, Ari or Akki, once boiled, has the greatest ability to look elegent in any combination of flavor or color. With little effort, the plain white grains can be transformed into a colorful explosion of reds and yellows and browns and greens. A staple diet in South India and many other regions across the world, the rice has endless ways of pleasing the most refined palate. Keeping in mind the theme for the month dedicated to Karnataka cuisine, here are my entries served with pooshinikkai morkootu. Boil rice and let it cool down for a while, add the til oil and mix it with the rice so that all the grains seperate easily. Make a small pit in the center and spoon in the turmeric and the zest. Heat up half the oil and roast the peanuts well. Set aside. To the other half add mustard seeds, chana dal, udad dal, hing, methi pwd, red chillies and let it roast up. Then add the green chillies and curry leaves. Pour this directly into the pit on the turmeric and add required salt. Once cool, add peanuts and lemon juice and mix well. The lemon zest gives it an extra flavor (a tip from my aunt). Grind the coconut, 1 tsp mustard seeds, tamarind, turmeric, jaggery and red chillies with minimum water. Spread the cooked rice and mix it with the coconut oil. Heat up the oil and add 1/2 tsp mustard seeds, chana dal, udad dal, 1 red chilli, hing and curry leaves. Add the ground paste and roast till the raw smell of tamarind goes. Add salt and mix this with the rice. I like my rice white and not-sweet, so left out the jaggery and turmeric. This is my aunt’s innovation for making instant puliyagare. It tastes just as good without the hardwork of making the pulikachal / gojju. Prepare the rice and mix it with 1 tbsp of til oil and methi kuria. Methi kuria is a spice powder prepared in Gujarat using fenugreek that is coarsely ground, red chilli powder and til oil. In the USA, it is available in Indian stores and in India, you may find it in khadi udyog. If, unavailable, roast 2 tsp of fenugreek seeds and dry grind into a fine pwd. This can be substituted for the same amount of methi kuria. Heat up the rest of the oil and first roast the peanuts and set aside. Then to the same oil add mustard seeds, chana dal, udad dal, hing, red chillies and curry leaves. Once the dals have browned, dissolve the tamarind paste in very little water and add it to the spices. add turmeric, roasted peanuts, jaggery and salt and let this boil till the raw smell goes and the paste has thickened up. Now add the dhania and pepper powder and pour into the prepared rice. Mix well and enjoy! I am packing these off to Asha for RCI-Karnataka! 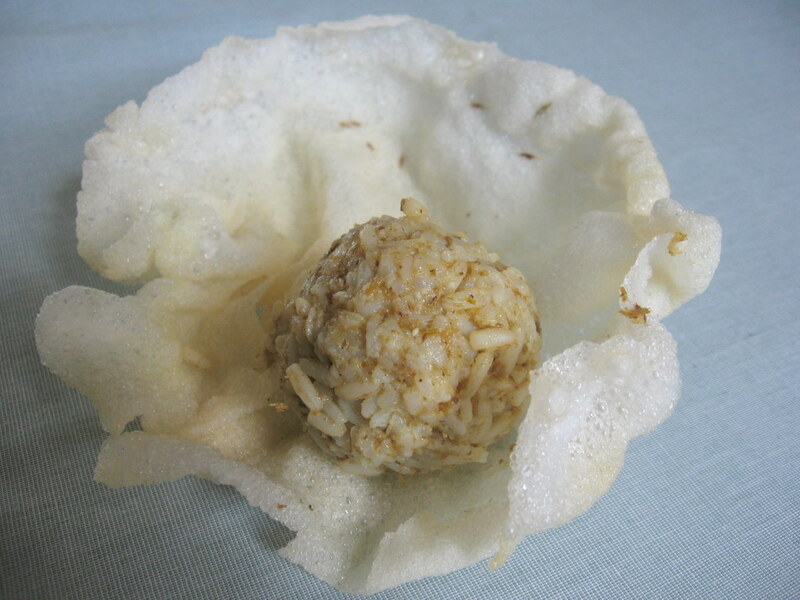 Yelai is leaf in tamil and vadams are rice crisps. The name is yelai vadam, because they are traditionally made using banana leaves. 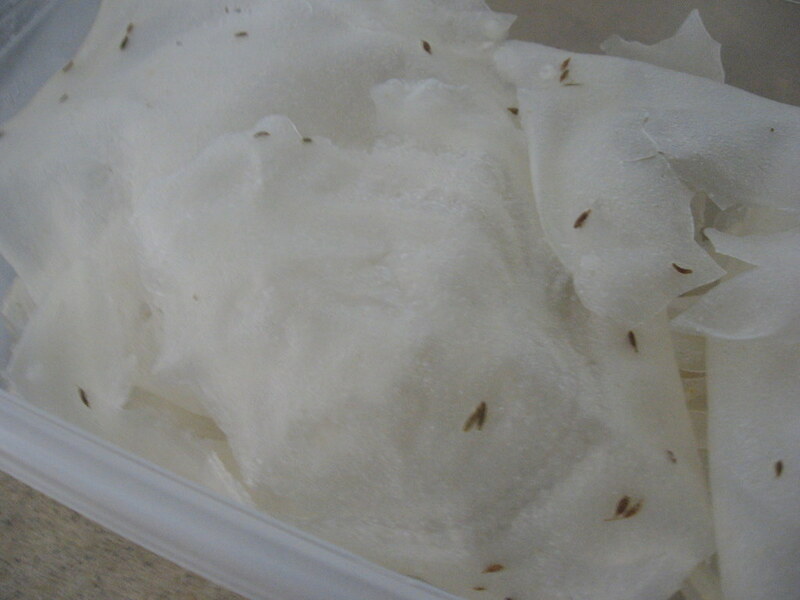 Basically vadams are like rice dosas that are dried and can be stored for a long time. Every time you feel the need to accessorise your menu or simply munch something, fry them or even microwave them to instantly satisfy your taste-buds. 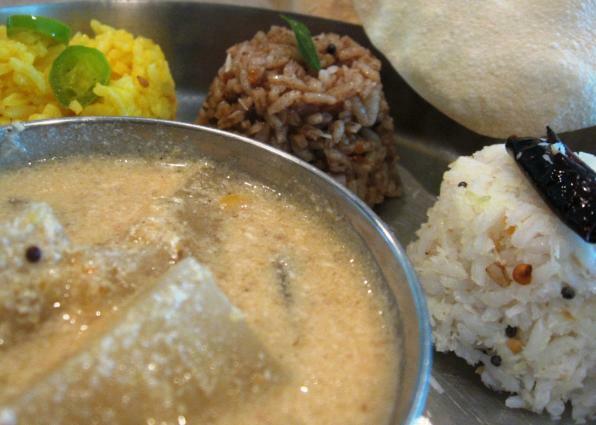 This is my entry for the first RCI – Tamilnadu hosted by LakshmiK at Veggie cuisine. My amma used to make a huge stock of vadams for the year and she dedicated a couple days in a year to fill up the big box in her pantry. My brother and I always made sure we were around when she made vadams. The best part of the process was eating the freshly steamed vadam right out of the leaf. My mom used to let us eat the vadams that tore out while talking them off the leaf and both of us used to greedily sit there waiting for vadams to tear up. I always bring these vadams from India, but by the time we reach our destination, they crumble up into tiny pieces during the transit. Though they are almost weightless, they occupy a lot of space in the luggage. Making these vadams is a time consuming process and only half of what you make ends up on the drying plate – the other half consumed as soon as they are made. Soak 1 cup rice overnight and grind it into a very fine paste. The best way to do it is to soak an extra cup when you grind rice for dosa. Add a little bit of salt (about 1/2 tsp) and keep it covered for 3-4 days. Open the lid and if someone in the living room says ‘where is that sour smell coming from?’ it is enough indication that the batter is ready to be steamed. Without disturbing the liquid inside, carefully pour out the top yellow layer into the drain. Add a pinch of hing, Salt to taste (remember, you have already added some 4 days back!) and 1 1/2 tsp jeera. Also, add a tbsp of sago soaked for about 2 hours. Get 3 stainless steel plates out of your cabinet and rub some ghee on each of them. (the plates we use as lids are perfect). Oh! 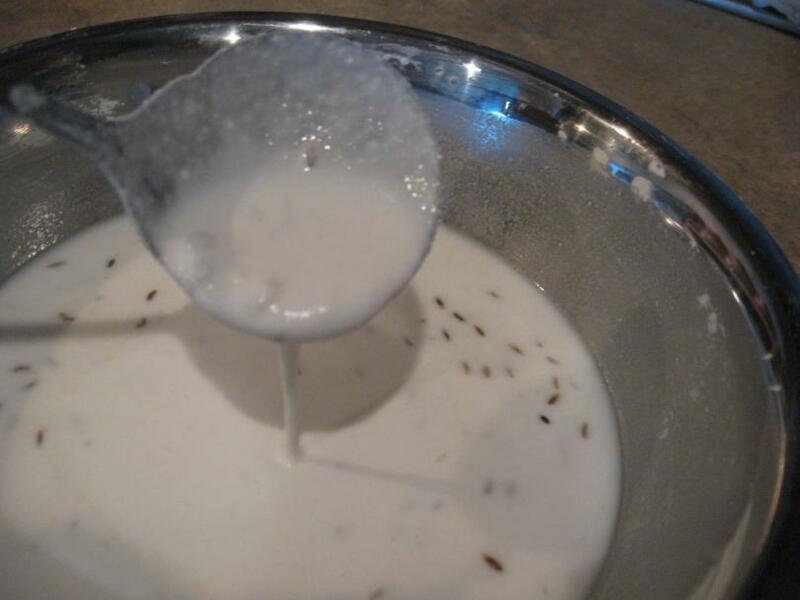 did I mention, we will be making thattu(plate in tamil) vadams instead? yeah. I can never find banana leaves here and this works just as well. Infact, MIL says she will continue making them in plates when she gets back to India. Ok, to start with, you will need a steaming set-up. Here’s mine. A pan filled with water to about an inch depth. 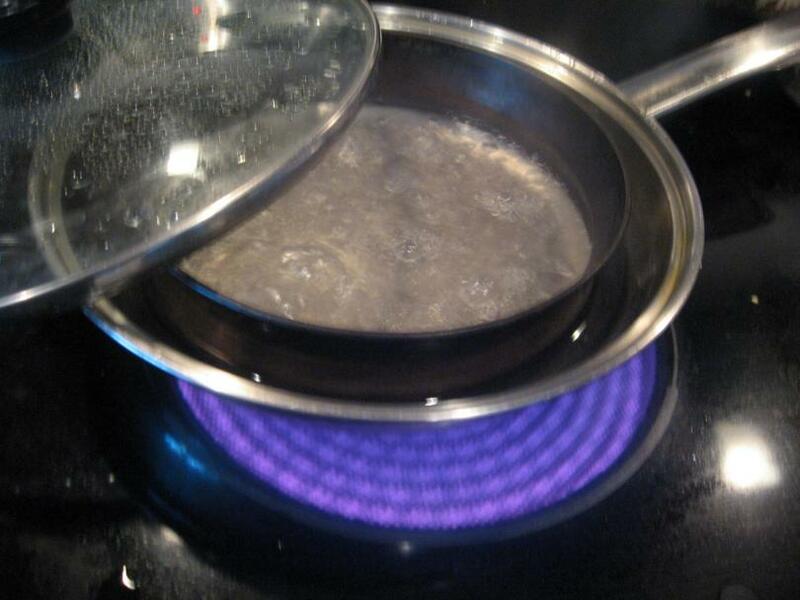 A circular rim placed in the pan to hold the plates at height and a glass lid that covers the whole pan. Make sure the water is boiling before you start steaming vadams. 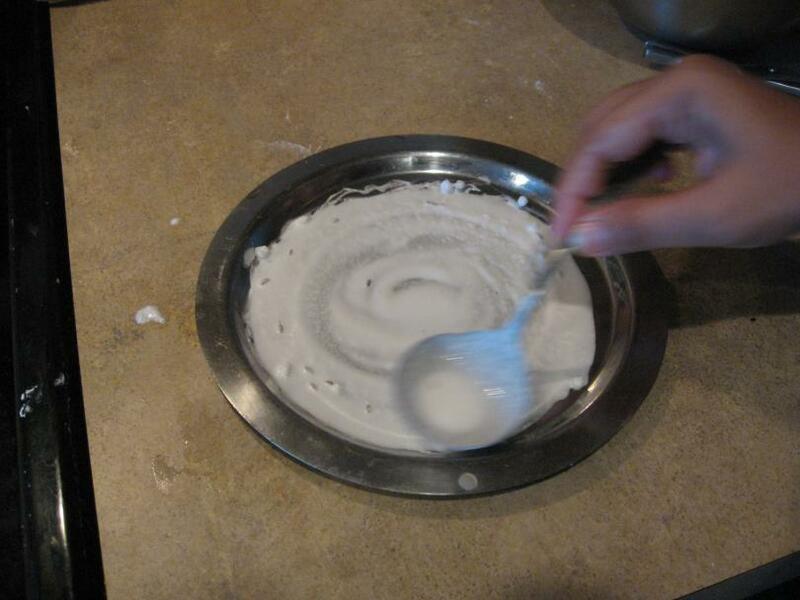 Pour a spoonfull of batter onto plate 1 and with a circular/spiral motion spread out the batter as thin as possible – just as you would make a dosa. Place plate-1 in the pan and close the lid. Steam for about 2-3 minutes till the batter is cooked and gets transparent. In the meanwhile spread out some batter onto plate-2. 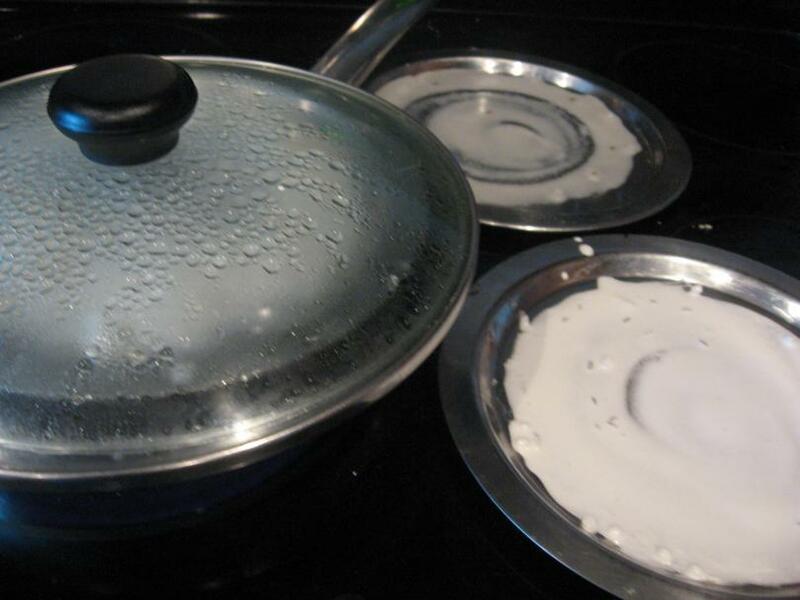 Remove plate-1, place plate-2 in the pan and spread batter on plate-3. Let plate-1 stay out for a while to cool down. 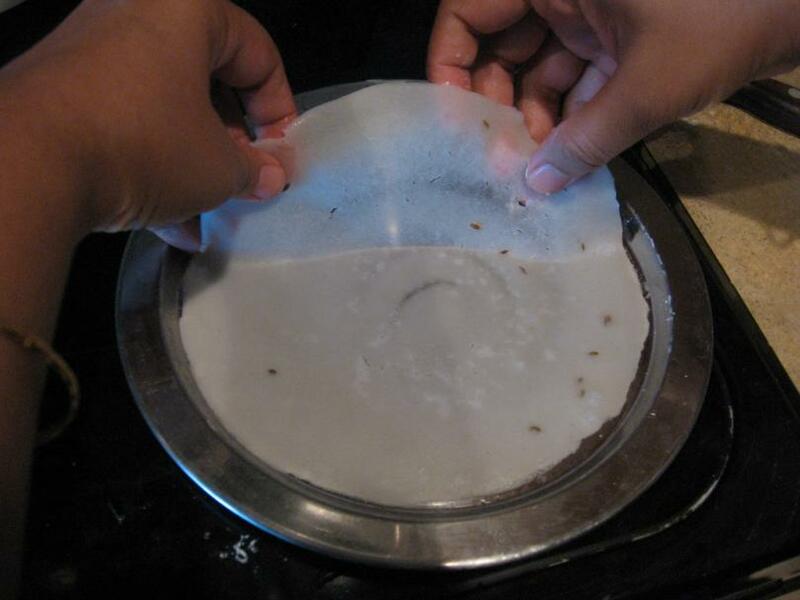 Use a knife to peel off one edge and using both hands peel the vadam from the plate. Repeat this process with the 3 plates. After 2 -3 cycles you get into the rhythm. This is the stage where you make an important decision. You could either pop it into your mouth or place it on a flat surface for drying. I recommend tasting the first one for salt. For drying, I usually spread a thick plastic sheet in my patio and place the vadams as close as possible to accomodate as many as I can. Do not overlap. I do not have an open deck and never get direct sunlight. So, if you are like me, worry not! The vadams do not require direct sunlight or too much heat. Even your dining table or a spare room is fine. make sure it gets some breeze to dry itself up. It may take about 4-5 days to completely dry in such cases. For those of you who have decks/terrace and lots of sunlight, you’ll will be ready to fry them in a day or two! Store the dry vadams in an airtight container. 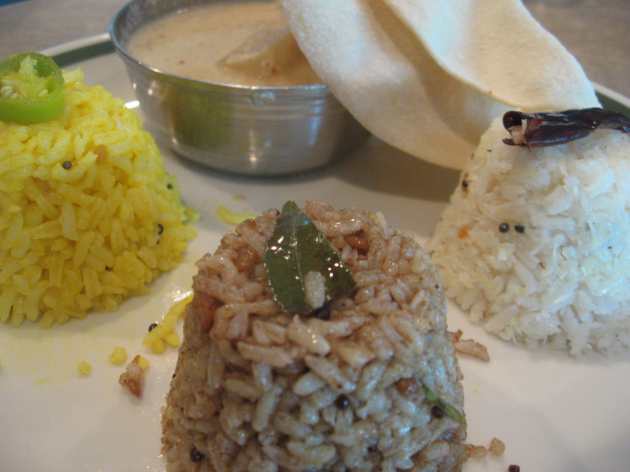 They go well with all the rice preparations – pulihorai, tomato rice, mint rice…you get the idea. They taste best when deep fried, but for the health conscious – rub a few drops of oil on the dry vadam and microwave on high for about 30-40 seconds. Here’s my fried yalai vadam with celery thokku rice. Celery thokku?….did you ask??? Yeah and that’s coming up next for JFI-Greens! !